I never cease to be impressed by the way this place infuses vegetables with enough umami and substance to make you swear they’d used a meat based stock. Stomach full, and on the 12 step program to recover from my porkaholism, I sauntered down to the Union Square Farmers Market to look for some inspiration. Sunchokes, stinging nettles and ramps seemed to be the flavours of the day, and I happened to have two of those ingredients at home already. I bought a pound of sunchokes and headed home, deciding to make a potage with some leftover stock and crème fraîche. After simmering the sunchokes in the stock for an hour, they were tender and had imparted a mild sweetness to the broth. The stinging nettles and ramps went in at the last minute, and a quick blitz in the blender turned an ordinary looking vegetable stew into a glorious green soup that looked like it might glow in the dark if given a chance. 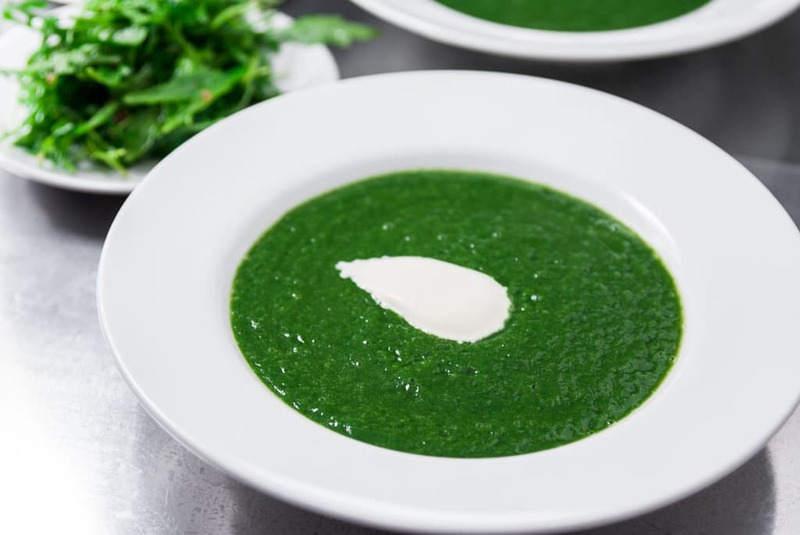 Luscious and velvety with just a hint of sweetness, this nettle soup is wild and verdant on its own or mellow and refined with a dollop of rich crème fraîche. The flavours are so bright and concentrated this would even be good served as a sauce over some sauteed fava beans, mushrooms and asparagus. Add the sunchokes and stock to a stockpot. Cover and simmer over low heat for about an hour, or until the sunchokes are very tender. Add the ramps and nettles and cook for another minute or two until the ramps are a bright green in color and the nettles are warmed through. Transfer to a glass blender and blend the nettle soup until smooth and bright green. Salt to taste then pour the green soup into 4 small soup bowls. Top with a dollop of creme fraiche per bowl and serve with some crusty bread, toasted and rubbed with a raw clove of garlic. Porkaholism, you crack me up. The color is so amazing. Alas, two things I have never had, ramps and nettles. Yummie! we call sunchokes in Dutch: aardperen!! This soup looks so fresh green & delcious! great soup!! I have never had sunchokes, stinking nettles, and ramps all in the same dish before, but your description sold it for me. And the color! I also love the idea of serving this over sauteed vegetables. Sounds fresh and fantastic! Great idea to use sunchokes, and the creme fraiche must give it great flavor. gorgeous. love nettles. I made a nettle soup – a little play on italian wedding soup. with israeli couscous and homemade stock and lemon cinnamon meatballs. The nettles have such a rich texture. I finally found ramps in sf. they were foraged in oregon. i decided to defy the ramp-dom and go for garlic buds instead. i think they can be used in some similar fashions. I’ve never eaten stinging nettles before. I’m just chuckling at the fact that one of your other commenters called them stinking nettles, lol 🙂 Will definitely have to try soup the next time I give nettles a whirl. wow! how lovely and delicious!! i’ve never had nettles, but they’re on my list of foods i want to try. Marc, I laughed when I read you are on the 12 step program from all the meat! Your dish looks amazing! I’m trying to add more veggies into my life too! What a gorgeous color, Marc! I bet it tasted as good as it looks. I’m a newbie to cooking with these three ingredients and like that I may discover all of them in one recipe. We just had a green garlic and nettle soup at Studio in laguna beach and really loved the flavor of the nettle. I’m hoping to find it around here too. 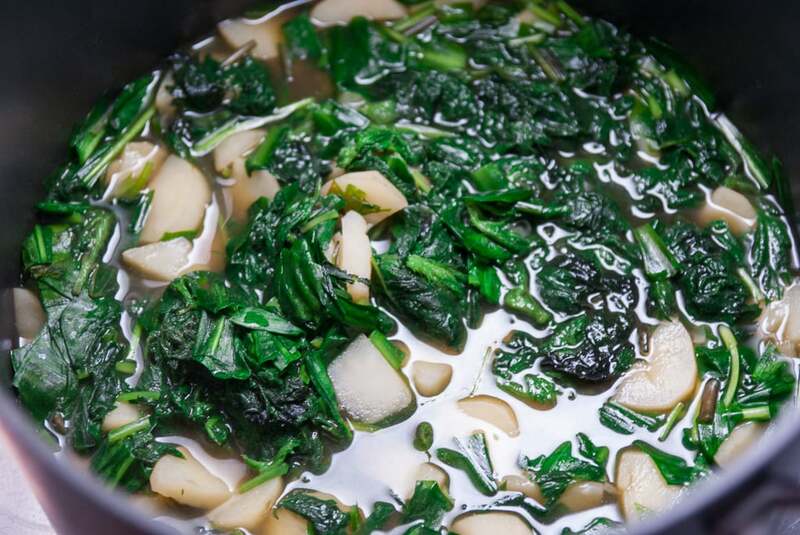 Your soup sounds wonderful with sunchokes and ramps too! Another great and beautiful recipe!! I have been on a mission scouring the earth for nettles and ramps but no luck yet. Come Spring time I do find my meat consumption going way down and sometimes non-existent in meals. So many awesome fresh flavors in fresh spring vegetables that I can’t stop eating them. 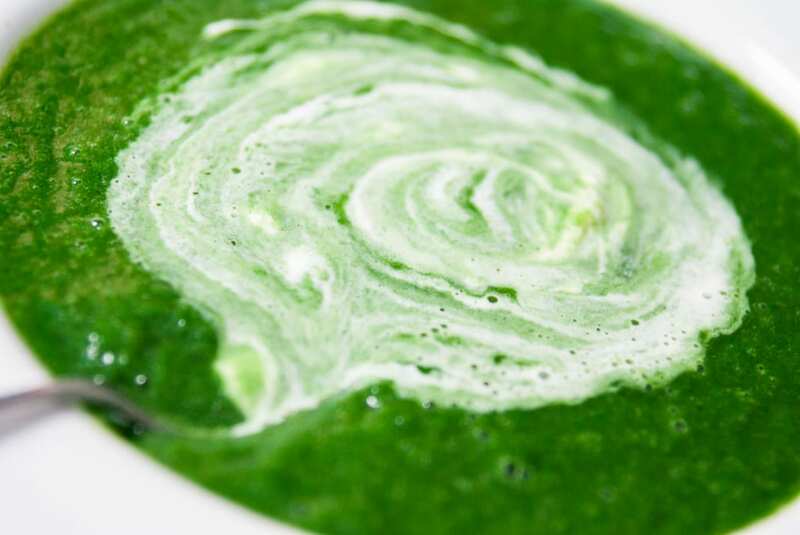 You should patent that color green – what a gorgeous looking soup! Great to see you at the Foodbuzz event. Clever use of the nettles! I am starting to also feel the need for something healthy. I guess only Stéphane is left in the porkathon. I love Tiffin Wallah, and the soup sounds amazing. Great stuff. I loved this soup! I turned the leftovers into crepes: 1 cup soup, 1/2 cup milk, 2 eggs, 2/3 cup flour, 1/4 tsp ground allspice, 1/4 tsp ground white pepper, 1 tsp salt. Whisk eggs and liquids together, blend in flour and spices, let rest for 30 mins. Fry thin crepes on hot cast iron pan in butter. They were great filled simply with some grated cheese and tomato jelly (chutney or chili jelly would probably work too). Can you use dried (herbal) stinging nettles in this recipe? I don’t think you’ll get the same color and flavor with dried nettles.